Youa��d think T Nagara��s Pondy Bazaar an unlikely place for a chic store that celebrates western and vintage influences. But Chintya Anish Iyera��s newly-opened Inch by Chintya seems to be as much at home in the midst of all the bustle as it would be on a quiet, less-crowded road. With bright colours jumping out at you, a vintage sewing machine table sans machine casually masquerading as an elegant table top, and several dressy mirrors hanging over the storea��s jewellery collection, the overall effect is of someonea��s fantastically-styled closet. 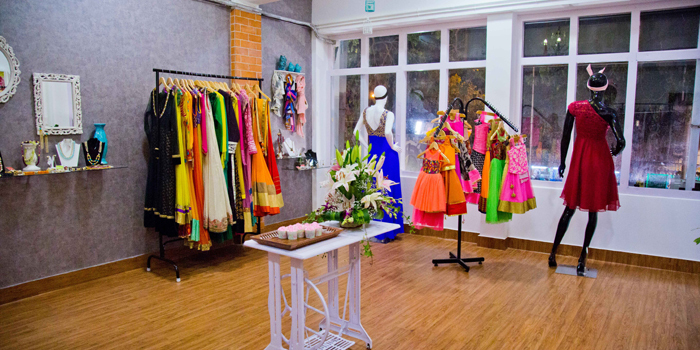 The 26-year-olda��s store offers Indian and western wear, jewellery and baby clothesa��from seven upcoming designers across India like Karni, Tango Charlie, Ira Jewellery and Zahana. The list includes Iyera��s own label, too. Iyer also offers custom fits. Her designs include saris with a touch of the Malayali gold. a�?Ia��m a Mallu, so that influence is going to be there,a�? she laughs, adding that her western wear has a vintage look. There are off-shoulder dresses, box-pleated skirts in floral prints and palazzo pants that remind you of the 60s. a�?Right now, my Indian wear consists only of saris. I plan to expand into maternity, too,a�? she says. For Iyer, the process has been a learning experience. a�?I have no background in designing,a�? she explains. a�?I studied hospitality, but eventually started designing clothes for myself and friends. My family owns a manufacturing unit, so that helped,a�? she adds, hoping to start an online store in three months.